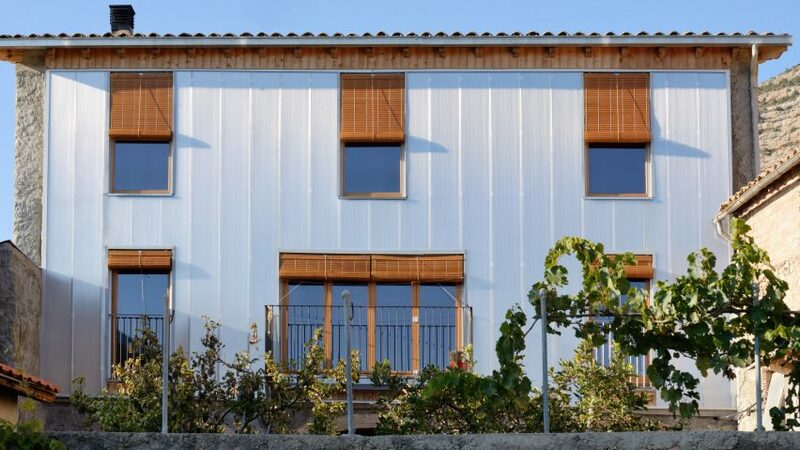 Bunyesc Arquitectes has transformed a house in northeast Spain into a low-energy building by adding a new polycarbonate plastic facade. The Lleida-based architecture studio aimed to improve living conditions in the old house, which is located in the town of Pessonada, by improving the building's thermal efficiency. To achieve this, the team installed eight-layer polycarbonate panels to the outside of the building's south-facing stone wall. The aim was to significantly increase the level of insulation and also allow the building to passively store energy from the sun. "This facade modification makes it possible to reach a pleasant indoor climate, by capturing the solar heat/energy and gradually transferring it indoors," explained architect Josep Bunyesc. The polycarbonate layer acts as an external layer of insulation, but also gives the exterior wall a much greater thermal mass, allowing it to slowly release heat into the building over long periods of time. "Due to the state of disrepair of the south facade it was not possible to significantly enlarge the size of the windows. Therefore, it was difficult to capture the solar energy and increase the heat gains," Bunyesc told Dezeen. "But this change transformed the stone wall into a large solar thermal collector." In the winter, the angle of the sun means that a great amount of solar radiation is absorbed by the polycarbonate. Contrastingly, most radiation is reflected from its surface in the summer, when the sun is higher, and therefore reduces the amount of heat absorbed. "The solution adopted becomes an affordable and really interesting way to obtain large areas that absorb solar energy," said Bunyesc. Residents can also use a biomass boiler to provide heating during the coldest months of the year, fuelled by wood. The new facade gives the building a completely different appearance. But – because it retains many of its original features – the house remains sympathetic to the traditional aesthetic of its neighbours, which cascade down a hill to the south of the Spanish Pyrenees. Inside, the house comprises a large open-plan living and dining area, and three bedrooms, two of which are accessed by a generous landing space on the uppermost floor of the three-storey property. The middle floor features one room that can be exposed to the elements, which acts as a transition between the interior and the exterior when open in the summer months, and acts as a greenhouse when closed in the winter. Interior finishes in the spacious home – described by Bunyesc as 'a cheap house' – are simple, complete with wooden detailing to complement the original structure that is left exposed across the ceilings. A contemporary kitchen is filled with bright red units, acting as a focal point in the generous open-plan living space on the middle floor. Other features include a ceramic tiled floor on the middle storey and a bamboo parquet floor on the upper level – both chosen to bear a resemblance to the vernacular architecture. Balconies added to the first floor for drying clothes echo those originally on the house, while a traditional choice of solar shading – external blinds – were also installed to allow residents to maximise natural ventilation. Due to the naturally sloping topography of the site, a large space open-air is located below the house on the south side. Accessed through three arches, this space was once used to keep horses, but is now used by residents for various domestic activities. Alessandro Armando and Manfredo di Robilant also used polycarbonate when they were commissioned to improve the interiors and thermal efficiency of a home in a 19th century neighbourhood of Massachusetts. Other examples of houses clad in polycarbonate plastic include a home near Bratislava, which was designed according to Italian Renaissance principles, and one in Hiroshima which uses the material to enable light to flood its interior.